You won't know which way to run with the Funny ANIMATED BUMP and GO ZOMBIE around! This creepy ankle biter moving undead torso decoration is sure to liven up any haunted house or Halloween costume party. He is only half the man he used to be, wandering around the room aimlessly looking for unsuspecting victims! 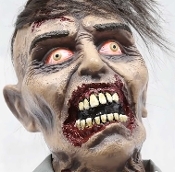 Nearly life size, standing at 24-inch (60cm) tall, the Bump and Go Zombie Torso haunted house prop is a motion sensor-activated roaming scary character, featuring eerie light-up eyes and frightening repeating spooky Zombie growling moaning groaning sounds. This terrifying zombie is getting hungry, and your guests are next! Posable arms and horrifically-blood-splattered torn shirt and hollow molded plastic head and hands. Easy assembly. Requires 4-AA batteries (NOT included). Indoor use only.